You have an idea and a deadline. We deliver the innovative interactive solution for your project. We are an interactive design, development and production company that has been creating compelling experiences for visitors in the museum, trade show and corporate center for the past twenty years. Our strength is in client service, experience and a broad knowledge-base that attracts clients from around the country, with our projects being deployed worldwide, from museums in St. Louis to tradeshows in China, we deliver. Fall 2012 – Omni recently began work on an interactive animation for VW that showcases the benefits of their TDI technology. The program will be rolled out at the Miami Auto Show in November. Fall 2012 – Omni is creating an interactive video experience for Standard Motor Products for the AAPEX show in Las Vegas, NV. Featuring large touchscreen monitors, the visitors will be able to access the catalog of TechSmart videos created by SMP. Fall 2011 – OmniMedia was contracted to create an interactive video capture booth for the software solutions company SAP. 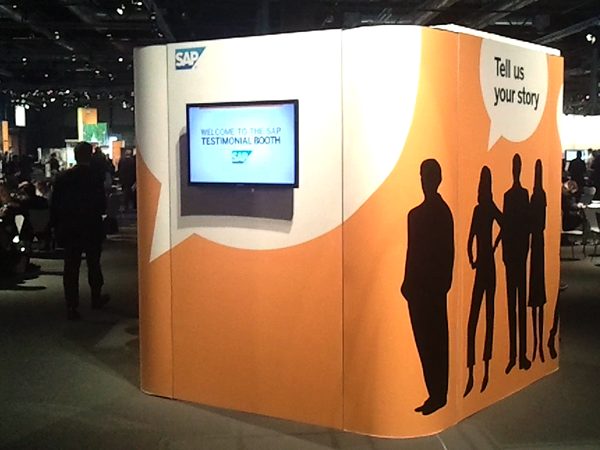 The booth captured video testimonials from SAP customers, vendors, and employees about their SAP experience. The software captured HD video with an interface programmed in three different languages.